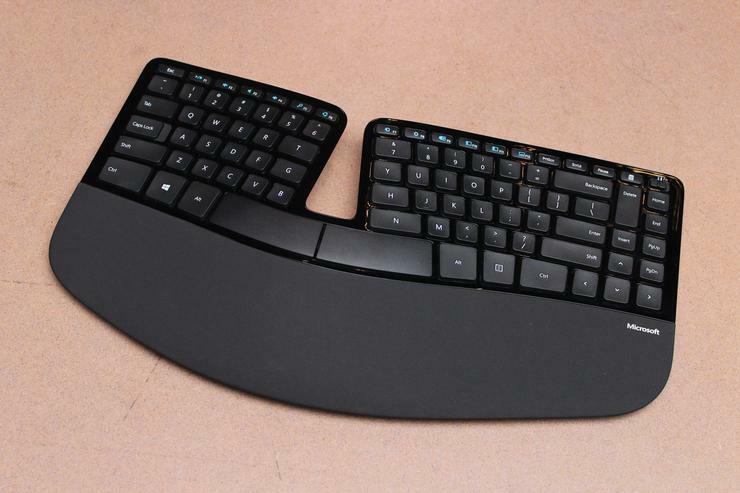 This keyboard's unique shape takes some getting used to, but RSI sufferers will find it worth the effort. Microsoft lets you know right up front its aim for the Sulpt Ergonomic Keyboard wireless keyboard-and-mouse combo. It re-imagines the shape of our most-used computer peripherals to prevent or reduce the effects of repetitive strain injuries like carpal tunnel syndrome. 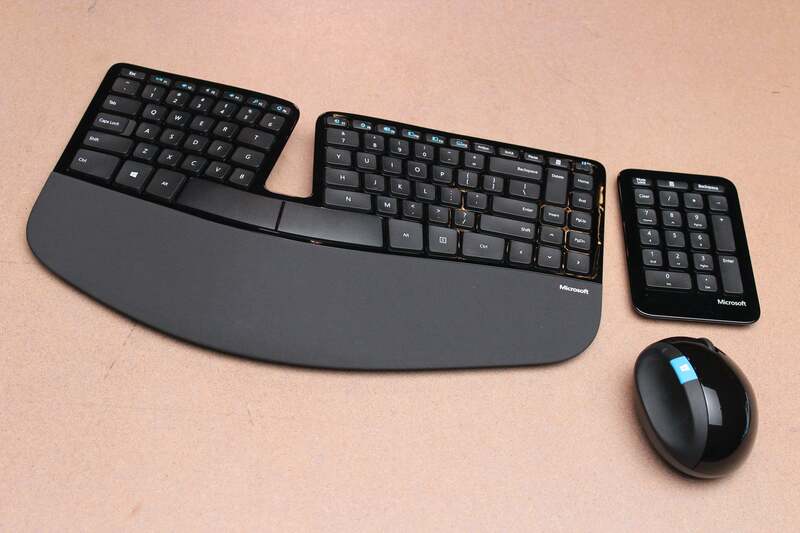 Behind the scenes, Microsoft dubbed the keyboard “Manta Ray” for obvious reasons. Its partially split design bends the keys up and toward the cutaway, evoking the image of the sea animal and its winged fins. It measures just over 15 inches across and includes a full set of alphanumeric and function keys. Microsoft lopped off the number pad to save space, as a lot of keyboard replacements do. Rather than dispense with it altogether, though, it includes it as a separate module that can be pulled out of a drawer only when needed. A pair of AAA batteries powers the keyboard; they’re included in the box and you have to install them. The mouse and number pad run on AA batteries and a single lithium ion battery, respectively, but these are preinstalled and you only have to remove their battery tabs. A small USB dongle is also included and cleverly stored in the mouse’s battery compartment for safekeeping when not in use. The keyboard’s “manta ray” design presents some challenges for touch typists, but the relief it should provide from injury pain is worth working through them. Split keyboards take some getting used to, and the Sculpt is no exception. The keys rise toward the cutaway to more naturally meet your fingers and reduce the distance they have to stretch when you’re typing. This makes the home row position very comfortable, with both wrists settled on the downward slopes of the padded wrist rest. But typing immediately presented some challenges for this touch typist. Right off the bat I had trouble consistently hitting the “B” key, overshooting it more than half the time. I had slightly better luck when I used the magnetically attachable riser included with the kit, as it seemed to tip that key into a more natural position. But ultimately only time helped me get the hang of it. I also had problems reaching the right Shift key with my pinky without lifting my fingers from the home row, and that never did get any easier. Several keys, in fact, seemed to require more stretching rather than less, most notably the “T” and “Y” keys. This no doubt has to do with the fact these keys each lie on the edge of cutaway at the Sculpt’s peak. Microsoft made these keys and the others along the cutaway slightly larger than the chiclet size of all the others to make them more easily accessible, but their position still felt unnatural. 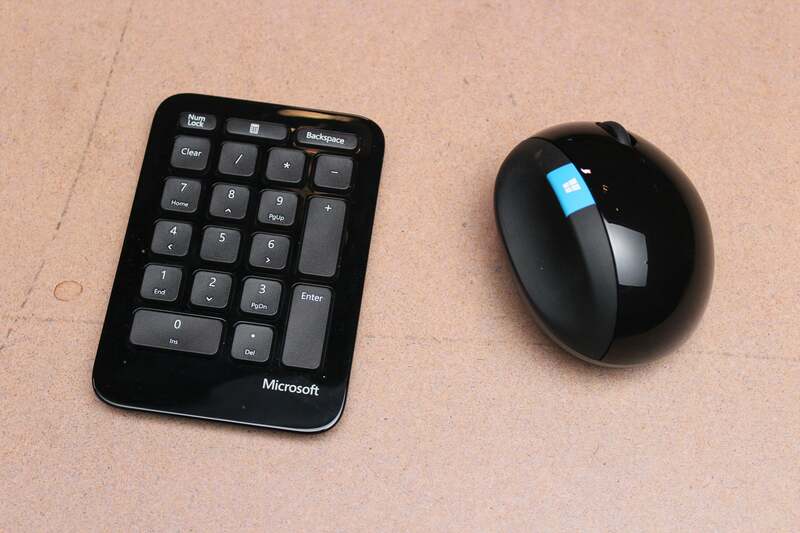 Microsoft removed the desktop keyboard’s number pad to save space but wisely included it as a separate module to be used as needed. With time I got used to most of the keyboard’s quirks, but they slowed me down considerably for the first week or so, a problem compounded by all the typos I had to fix. The Sculpt’s accompanying mouse has gotten some negative feedback, but I found it quite comfortable to use. The oval shape fit naturally in my hand and kept my palm from coming into contact with the desk or table. Its two buttons and scroll wheel are optimally placed for your index and middle fingers, and it includes a thumb-accessible Windows button for easy access to the Start menu. It also tracked smoothly on a variety of surfaces—I even used it on the arm of a leather recliner with no issues. The only drawback is the thumb cutaway, which is positioned for right-handed users, so don’t get rid of your current mouse if you’re a lefty. I liked the Sculpt’s durable and thoughtful design. But without the pain of an RSI I just didn’t have the incentive to work through 25 years of muscle memory to conform my typing to its unconventional layout. If you do suffer from RSI or are at risk for it, though, you’ll likely find the modest learning curve well worth the effort.